Accompanying the bus is a trailer and a staff of friendly ambassadors who take visitors on a tour of the concepts behind precision medicine and its relationship to a research program that is methodically looking for a million or more volunteers. The All of Us Journey is open for business. Francisco Huizar manages the Journey crew that visited Salt Lake City. “What we are doing is traveling around the country trying to educate people on the importance of participation in research and why participating in precision medicine is key,” said Francisco Huizar, tour manager for the Journey, a traveling exhibit visiting libraries and other venues that serves as an informational and recruiting tool for the All of Us Research Program overseen by the National Institutes of Health. The trailer part of the set-up features short activities that explain the concept of precision medicine, an approach to research, diagnosis and treatment that relies on advances in technology to focus more closely on individual differences among patients. The bus portion serves as a recruiting station for the program, which asks volunteers to share their health data in the interest of diversifying the pool of people whose data are available to biomedical researchers. Volunteers for the program agree to have their health data – including biomedical samples, access to health records and survey answers about their health habits – placed into a privacy-protected database that future researchers can use for a full range of inquiries. Plans call for willing participants to be tracked for at least 10 years. The miniature health fair held at the Glendale Branch is typical of how the Journey goes about its mission, whether at a library, YWCA or other location. The Journey sets up shop, preferably with the support of other activities like the health screenings offered by the University of Utah Wellness Bus at this event. The two-part Journey unit includes a trailer for exhibits and a bus used for recruitment. Journey staff are on hand at the exhibit trailer to explain how the activities relate to precision medicine and the All of Us mission. The additional activities bolster the Journey’s impact, and vice-versa. Visitors usually start with an exhibit that points out one of the most basic examples of individualized medicine, prescription eyeglasses. It includes a virtual reality activity in which participants get to experience life with certain medical conditions. After the exhibit, participants over the age of 18 are given an opportunity to sign up for the program if they would like. 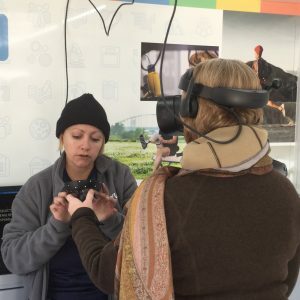 Mel Lopez, assistant tour manager, helps a visitor with virtual reality equipment used in the exhibit. “People understand the importance of it,” Huizar said. The Journey’s two units have visited communities as big and urban as Houston, Texas, and as small and rural as Cody, Wyoming. Their primary focus is on populations underrepresented in biomedical research, which can include racial and ethnic minorities, women, rural and urban populations, those with low income, LGBTQ communities, and several other categories of people. For libraries, the Journey makes an interesting visitor to the parking lot or addition to an outreach event, and it pairs well with other health-related activities. The Journey’s support staff can provide information on the logistical requirements necessary for hosting the exhibit. Library staff interested in hosting or volunteering for the Journey can go to https://www.joinallofus.org/en/journey for more information or call (833)-ALL-OF-US. Or they can contact the National Network of Libraries of Medicine All of Us community engagement coordinator through the NNLM regional medical library for their area for information on both the Journey and library funding opportunities. 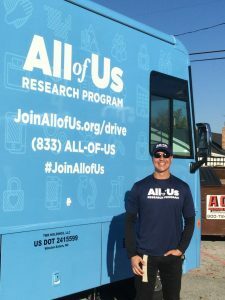 Those interested in signing up to be a participant in the research program can learn more at JoinAllofUs.org.